Craft beer from seven area breweries, including Bold Mariner Brewing, Coelacanth Brewing, O'Connor Brewing, Rip Rap Brewing and Smartmouth Brewing. Stay tuned for other participating Hampton Roads breweries. Exclusive after-hours admission to the Virginia Zoo (3500 Granby Street in Norfolk). Zoo animals will be on exhibit until 7:30 p.m., but the festival will continue until 9:30 p.m. (perfect timing for coming over after the afternoon ODU football game!). A free 64-ounce commemorative glass growler for general admission ticket holders (given as you exit the festival). Games, night-time Pokemon hunting and some of our region's finest food trucks. Special-priced tickets for youth ages 2 through 20 and also designated drivers. Free admission for children under age 2. We will need Rotary volunteers to help during the festival. Stay tuned for details. 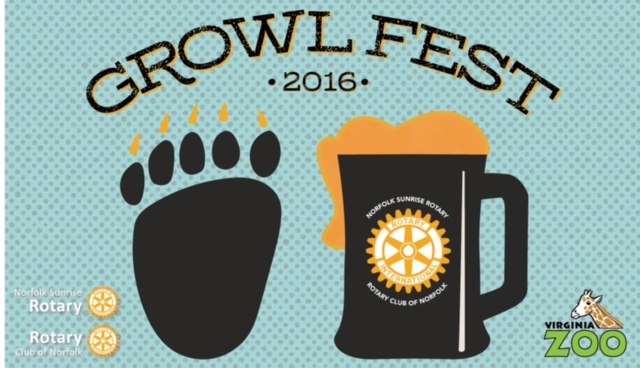 Benefit the Virginia Zoo, the Rotary Club of Norfolk and the Norfolk Sunrise Rotary Club. Both Rotary clubs support a variety of Hampton Roads nonprofits. Questions: Contact Bryce Burton, Rotary Club of Norfolk at Bryce@burton-lumber.com.